To enroll in classes, you are assigned a specific enrollment appointment time, which is the earliest that you can begin enrolling in classes for a term. You’ll receive an email from the Office of the Registrar with your enrollment appointment time. After times are assigned, you can find yours on the “Course Search & Enrollment” tile in MyUW. 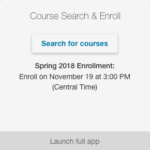 Your enrollment appointment time is also displayed on your Student Center home screen. Enrollment appointment times are based on a student’s academic program, projected class standing (e.g., senior), and number of credits (earned and in-progress). Some specific student populations (e.g., students identified by the Veteran Services & Military Assistance Center as veterans or active-duty service members) receive priority enrollment. Some large groups, like sophomores, have enrollment appointment times distributed across multiple days. The approximate schedule for the earliest that continuing and reentry students may have appointment times is in the table below. If your assigned time is significantly different than what you’d expect (like if you have earned Senior-level credits but your time isn’t until after Sophomores begin enrolling), please contact us.